Sometimes an image just grips you. That’s what happened when I saw this postcard featuring The Gospel Lighthouse Church. The building was so odd-looking and cool. Who designed it? Where had it been? And what was that thing on top of it? I did a bit of research on the church and found out that it was organized in Dallas in 1940 by Pentecostal preacher J.C. Hibbard and his wife Nell, who was also a preacher. The two had been preaching at the Oak Cliff Assembly of God Church until J.C.’s divorce from his first wife (and subsequent second marriage to Nell) became such a point of controversy that the two felt compelled to leave (or were asked to leave) the Assemblies of God, and they formed their own church. 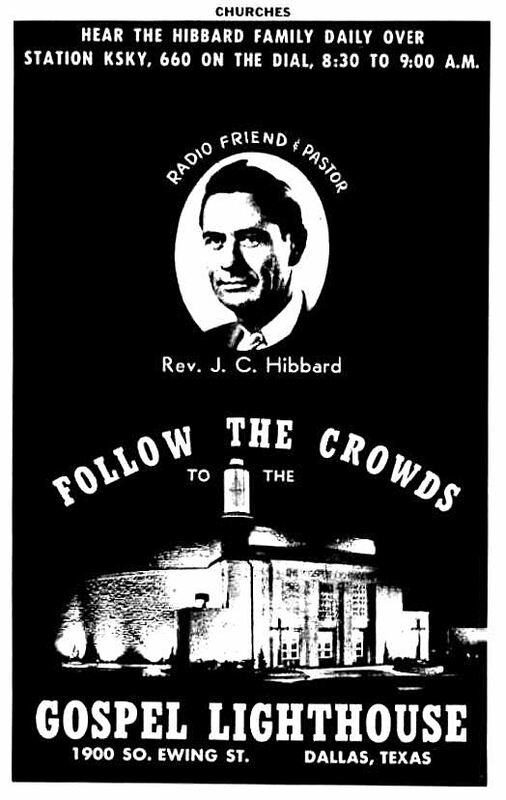 By 1948, J.C. Hibbard had become so popular (largely as a result of his daily radio sermons) that ground was broken on a larger church, designed by J.C. himself. It was right next to the first church. And it was pretty elaborate. Yeah, the lighthouse part of it looks a little cheesy, but with a name like “Gospel Lighthouse Church” you kind of have to have it. 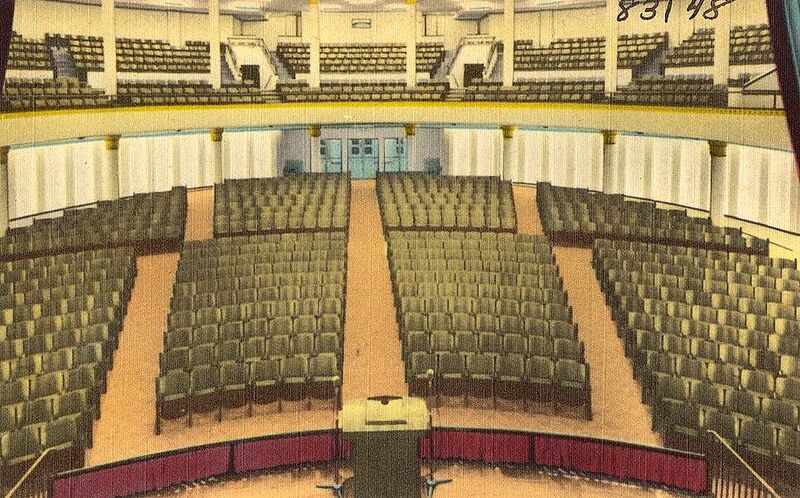 The auditorium and its mezzanine. 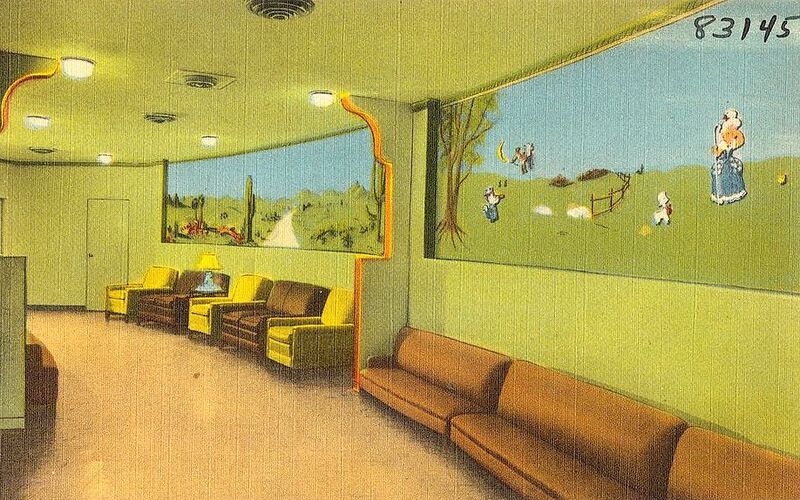 The nursery, with elaborate murals. The lounge. 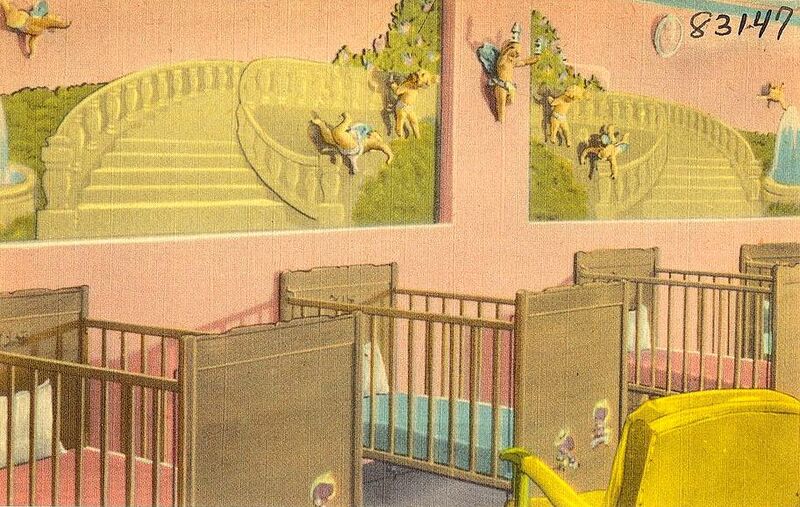 Like the first church, this one had a nursery with a lounge — a “crying room” for mothers to tend to crying children without having to miss a single moment of the service. The crying was contained behind sound-proof glass while the sermon was piped in through speakers. The church had a lot of other amenities, but these were the only ones I’ve found deemed worthy enough to put on postcards. Above, the first church — “a modern concrete and steel building, overlaid with white Austin stone” — which was built with help from the congregation in 1941. The beam of “bluish mercury-vapor” emanated (somehow) from the squat lighthouse above the foyer. And, below, the later church, next door. I think the “mercury-vapor” was replaced by neon. But I could be wrong. Does either beacon light up anymore? 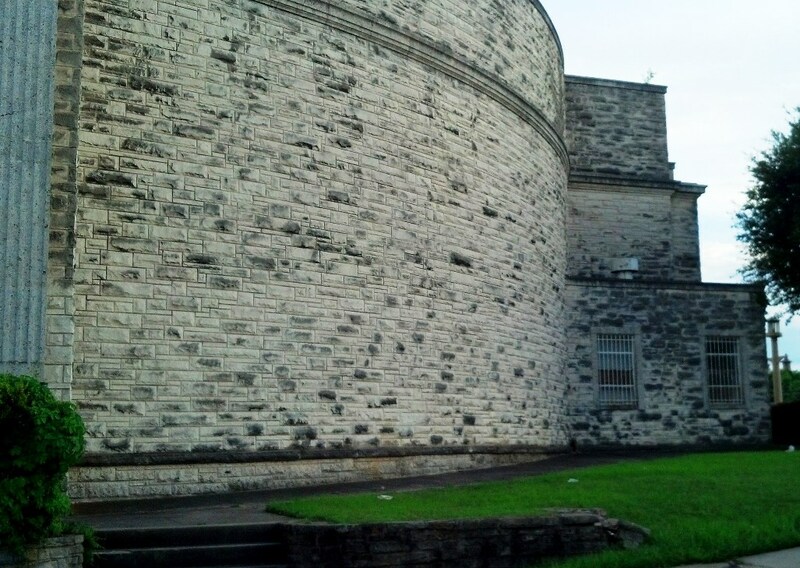 Aside from the “lighthouse,” the most distinctive feature of this building is those rounded walls. So beautiful! The building is actually pretty impressive to see up close. Next time you’re in the neighborhood, check it out! Postcards from the Boston Public Library Tichnor Brothers Postcard Collection on Flickr, here. Period black-and-white photos are from a page detailing the history of the Gospel Lighthouse Church, here. A biography of Rev. Hibbard from the same site can be found here. Wander around the block on Google Street View, here. Blue mercury vapor? Wow, what happened to that light over the years? I don’t know, but I think we missed out on something pretty spectacular. I remember this place from my childhood. When I was a kid you could see the blue light from the freeway. We would drive past it on the way to and from my grandparents house or the Astro Drive In . I was and still am fascinated by it. I wish I could have seen that — sounds like it might have given the impression of a flying saucer more than a lighthouse. That building is really interesting, and I encourage everybody to drive past it and take a look. Very cool-looking. Perhaps it was neon , I’m not THAT OLD ,but I definitely know the place. As a matter of fact what lead me to your article was a dream I had about Oak Cliff and my childhood. I woke up ,googled the place ,and read your story. I remember seeing it from the freeway and asking my mother if we could drive up there. My sister exclaimed ” that’s a cult”. I’m sure she must of heard that from my devout Catholic Grandmother.My sister was also a kid at the time. The light house was lit up at night though. Is it still? That’s why I noticed the place. This was late 1970s early 80’s. I remember this family from when they first started that work. They sang and preached on a little fifteen minute radio program on KSKY. Our little youth group had a small chorus at our church (Sunset Church of Christ) and I was not a singer but my now husband and sister and other friends sang a little them song on a fifteen minute program at same station. We went to KSKY and think it was on Maple in the Stoneleigh Hotel, and Homer P. Reeves was our minister. He did a short little sermonette and our little group sang (Acapella). WE would often wait until the Hubbard’s program was over and we could look into a window where they were singing and preaching. I think some of their little children may have sung, too. And someone played a guitar. This has been over sixty-five hears ago, and my memories are maybe off a little. I never knew a thing about their history or the reason they started the Gospel Lighthouse, but I do remember seeing Mrs. Hubbard and a daughter shopping at downtown Nieman Marcus often. This must have been in the mid-sixties, as we moved back to Dallas in 1960l. None of the women wore any makeup but had elaborate hair styles. Thanks so much for these memories! Since I wrote this, I keep seeing Mr. Hibbard’s name popping up all over the place. Radio was certainly a good way to get your name in front of a large audience. As recent as the ’70s and ’80s? I don’t think it still lights up, but maybe it does. And neon probably replaced the much, MUCH more exotic-sounding “mercury vapor.” The idea of the otherworldly blue beam and the “cult” thing just makes it all more interesting. Paula I am very glad to have found your site a few day’s ago. A new Gospel Lighthouse was built a few years past at West Illinois and Walton Walker, or Loop 12 if preferred. I remember the original church and it being considered a ‘Holy Roller’ church by those who worshiped a bit more covertly. The South Ewing area was older homes mostly prewar, I remember this was where many parents of friends grew up and where their grandparents still lived. Neat old church that may have been considered a bit flamboyant in the 40’s.. Thank, Smokey. That architecture is certainly flamboyant! ..I was terrified and mesphorized. Awful memories of ” church”. Yeah, me too, Gwinnetta. Ha. I doubt the casket thing happened. Could have been part of a skit or something. I went to this church from 1962, year I was born until the church moved to the new location at 3911 S. Walton Walker Blvd. in Dallas, TX. I was 15 when the new church opened. I have the most wonderful childhood memories at this church. It is actually a dream of mine to go back and visit. Just to go inside and walk down memory lane. My mom, dad, three sisters, and one brother all attended along with my grandmother and 2nd cousin. I am so glad I found this information. My father preached in the church many times and the Hibbard’s were personal friends of our family’s. My most memorable memory of the church was a prayer room beneath the pulpit. It was dark with a spotlight on a painting of Jesus praying in Gethsemane. I loved going in there. Thanks, Tommy. I wonder what the place looks like inside now? Tommy, I have just recently married and moved from Georgia to Texas. I first noticed the Church a few weeks ago, and it fascinated me beyond anything that I can say. I grew up in a Holiness Church in Georgia that was non-denominational, definitely not charismatic, though. I grew up with honestly, people, whom I believe were the greatest in all the history of the world. I am still a young man, but Church is so unspeakably different today than many years ago. It used to be so real. There was such a reverence for God”s Spirit. There have always been hypocrites, of course, but people in days gone by, for the most part, really lived for Christ, if they claimed The Name of Jesus. There was a difference in true Christians years ago. They were Holy, and if someone met them, whether they liked them or not, they were often forced to respect Christ Jesus in their lives, because people knew that what they were seeing was real. I have always been fascinated with Dallas’ history for legendary ministries. Men such as Jack Coe, W.V. Grant Sr., and even The Voice of Healing, that Reverend William Branham, Gordon Lindsay, and many others were once involved with.Tommy, if you know anything about The Hibbard Family, or what has become of The Ministry and The Church there on Highway 12, please feel free to contact me. I would greatly love to talk with you at length about many things. May The Lord Bless You Always, and Thanks. Thank You, Sister Wilbanks, for your reply and your Testimony. I am so sorry that I have not responded sooner. That’s okay. Be sure to look up the links that I posted to see what t was like in those days. Thank you Paula for your article. Interesting observance, and it is traveling on some of our Facebook pages. For your info., I was saved and baptized by Bro. JC Hibbard in the first Gospel Lighthouse, the one with the lighthouse replica on the front. My Aunt Marie and Jay Hibbard, (Jr. at the time) were married in that building. That is the building where Mother, as one of the prayer warriors, joined in their daily prayer meetings. Those prayer meetings were responsible for the many, many, miracles that took place by the power of God through Bro. 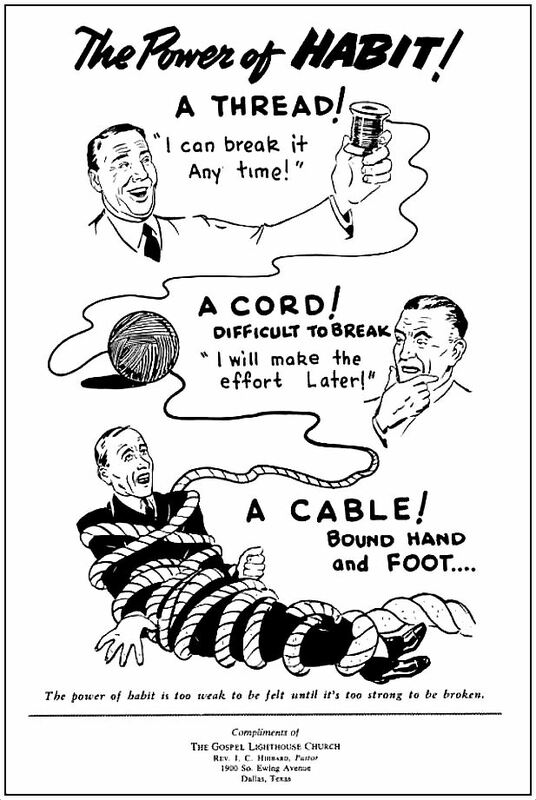 Hibbard’s ministry in the ’40’s. The other building was opened up when I was about 14 yrs., I think. I was in a big Easter play there at that age. It was where I was married in 1955. The prayer room was phenomenal, with the power of the Living God, and has not been replicated anywhere I have been since that time. I am now 79 yrs. I would not trade my upbringing in that atmosphere for anything, anything!! The power of the Holy Spirit was so present that it impressed my life forever. The church definitely was NOT a cult, as some of the comments of this new article expresses. Now, we know why the theme song of the daily radio program was “Let The Lower Lights Be Burning”. “Brightly beams our Father’s mercy from His lighthouse evermore. But to us, He gives the keeping of the lights along the shore. Dark the night of sin has settled, loud the angry billows roar. Eager eyes are watching, longing, for the lights along the shore. Trim your feeble lamp, my brother, some poor sailor tempest tossed, trying now to make the harbor, in the darkness may be lost. Let the lower lights be burning. Send the gleam across the waves. Some poor fainting struggling seaman, YOU may rescue, YOU may save.” You can click some of the links and find this song in the archives of the Hibbard songs. BTW: To set the record straight, he remarried only after his wife left him, and their three children, because she no longer wanted to be in the ministry and found another person for her life. He and the kids were alone for a while, and when he did remarry, he was no longer “allowed” to stay in the Assemblies of God denomination, as a minister. Thanks for your comment, Janice. J.C. Hibbard sounds like quite a charismatic preacher. I love the fact that he and the congregation built the first church with their own hands. Yes, he was very charismatic, Paula. 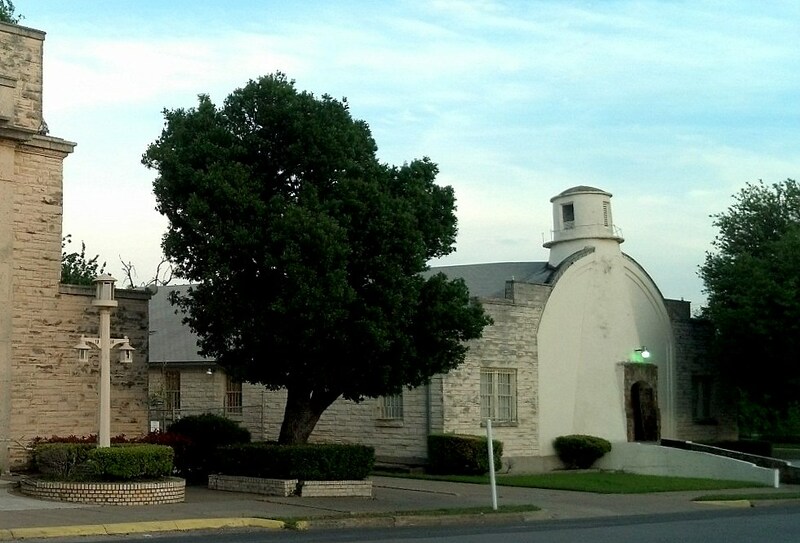 The Gospel Lighthouse, was one of three of the larger churches in Oak Cliff, in the ’40’s & 50’s. Sunday School attendance was around 1100 – 1300, and the three churches had contests to see who could get the most in Sunday School. The other two were Bethel Temple Assembly of God, Albert Ott, pastor, and Oak Cliff Assembly of God, H.C. Noah, pastor. The days of revival were very prominent in all three churches. That is sad to be called a cult, because it surely was not!! It was a normal “Pentecostal” church who allowed the moving of the Holy Spirit, to have the freedom to have His way. There was much shouting and joy in the Lord. Sometimes, when the Holy Spirit is moving, some people may “act out” of their “flesh”, not motivated by the Holy Spirit at all, and then, sometimes demons in a person will manifest, but it still is NOT a cult. The pastor puts a stop to that, but it has happened before he could stop it. We were free to live as we chose, however, Bro. Hibbard was a good shepherd, and he did correct us, (especially his youth group) when he felt it was necessary. Many, many, of us are so grateful for his pastoral guidance. There were restrictions on “worldliness”, but in the ’40’s & ’50’s many churches and denominations were preaching warnings against the sins of the world. That doesn’t seem to happen that much anymore. I guess it is not “politically correct”. But, please, let me be clear, that church was NOT A CULT. 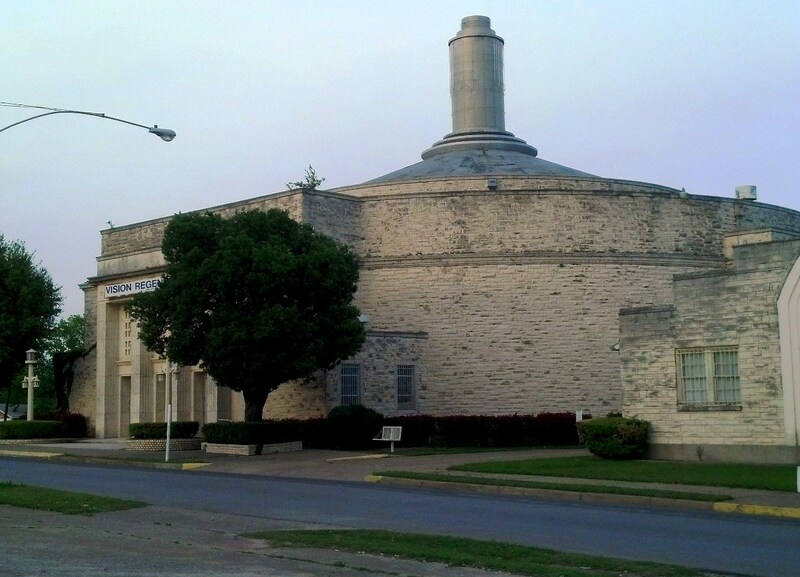 Paula, Bro Hibbard and the congregation not only built the first church, they also built the round church and the present building on Illinois at 408. Both the round church and the present church sanctuary ceilings were designed to look like the night sky with sparkling stars when lights were turned down. My family started attending the church when I was 18 months old–a few years before the round church was built. The Gospel Lighthouse Church just celebrated it’s 75th anniversary. Thanks, Gwinnetta. I see by Googling that there are several Gospel Lighthouse Churches around the country and in Canada. I don’t know if they’re related because I have to admit that I had never heard of this church before seeing the postcard at the top of this post. Full Gospel Holy Temple bought the Ewing property after the Gospel Lighthouse moved to the Illinois location. I believe they sold it in 2002 (here is a description in their listing). Not sure who bought it though. Recognized in the city of Dallas for impeccable stewardship of God’s resources. Full Gospel Holy Temple is pleased to present this opportunity to acquire an existing place of worship. The opulent, dome shaped sanctuary has a seating capacity of 2000. This church is well maintained and Ready for Service! Lot’s of personal property to be included. The furniture and fixtures are remaining with property The property features a commercial kitchen, plenty of office space and/or classrooms, meeting rooms, nursery/day care center, common area, men and women’s restrooms, open choir loft that overlooks sanctuary, baptistery, activity center, and a large surface open parking lot for 400. Property has a full lower level (basement) with classrooms, offices, and a prayer room. Approx. 55,000 SF of bldg space and 120,000 of land space. All this available for new ownership. Activity center offers a small chapel with a mini kitchen area. A single family dwelling sits on property and is included with purchase. Thanks, for all this additional info, Gwinnetta. I’m not sure I realized it was quite so spacious inside, but that parking lot across the street IS pretty big. Was on staff for 14 years and Bro. & Sis. Hibbard were the greatest two people I ever worked for. Miss them every day, great memories. Did all the Radio Broadcast, TV Productions and served as church organist after Clifton Hix retired. Hello Jim. I’m Don Tennison, one of J.C. Hibbard’s grandsons and am interested in getting more sermons either in audio or video format for his website. I’ve contacted many folks who have shared cassette tapes that we converted to digital format and have posted on his website. I remember that he also had a TV program but don’t have any video recordings. Do you have access to any of the programs? I remember Brother Walthers was his sound engineer for many years and also wondered if he maybe had a collection somewhere. I’m sure they would be a great blessing to share. Thanks. Hi Don Tennison. In the interest of accuracy, mom tells me Sister Hibbard’s maiden name was actually Nellie Berle Conner, not the name shown in the home page. The website is really really good and a wonderful tribute to their ministry. Thanks for all the work that goes into making it better. Hi Cindy, Well evidently your information turns out to be at least partly correct and the website information partly correct. Her name was actually Nellie Bearl Conner. I really appreciate you mentioning the error so that it can be corrected. The source of the correct information is from one of her daughters, Darlene Hibbard-Walker. Thank you! 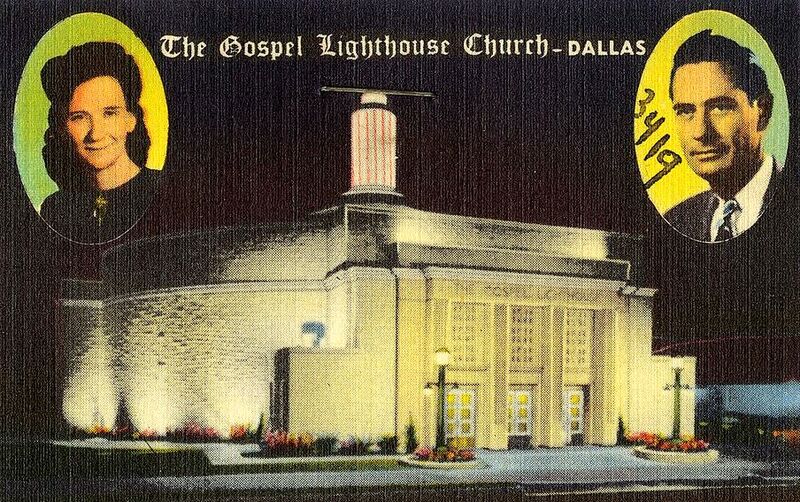 I first attended services at the Gospel Lighthouse the summer of 1960 when I was attending the Stamps Music school held at Bethel Temple in Oak Cliff. Again in the summer of 1961, my mom and I did the same thing. Later, Merv Walker, later J.C. Hibbard’s son-in-law (now living in Hawaii), was my pastor in Big Spring, TX for a short period of time. After moving to the Dallas area in 1973-93, I was a neighbor to Merv in Richardson for many years before I moved to the NW. It was in March the 19, 1979; when Jesus came into my LIFE. I was a Catholic n tried to take my own LIFE . I didn’t find the LORD in the Gospel Light House but Sister Hubbard’s radio sermans were a blessing to me. She prayed for me several times. Every once in a while I would go in person to hear her daily sermans which were being transmitted in the radio. I went for a visit this morning and I was blessed with NICKY CRUZ TESTIMONY. He is also suppose to be their tonight.Awesome ! I’m glad I ran across this site, I remember going over to Dallas from Fort Worth back in about 1957 just visit the Gospel Lighthouse. My mother and Grandmother would listen to Bro. Hibbard on KSKY every morning. Real memories. I was raised in this church as a child in the 80s and 90s. The name of the church at the time was Full Gospel Holy Temple, Apostle Lobias Murray. It was a amazing ministry! I never got a chance to take a tour of the whole church, but it would be a dream come true! The building was well maintained and beautiful!